A Monterey-area mother and son who were injured in the July 6 Asiana Airlines at San Francisco International Airport have sued the airline in federal court in San Francisco. 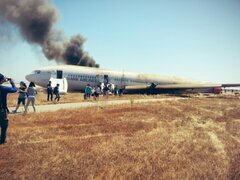 Three teenage Chinese schoolgirls died as a result of the crash and more than 180 passengers were injured when the low-flying Boeing 777 struck a seawall bordering San Francisco Bay and the tail section was separated from the aircraft’s fuselage. Michael Verna, an attorney for the family, said the case appears to be the first lawsuit against the airline in connection with the crash. The lawsuit asks for $5 million in damages for injuries and emotional distress. Machorro’s husband, Hector Machorro Jr., is also a plaintiff, saying that his wife has been unable to provide comfort and care to their child and to himself. Verna said the mother and son were both injured in the neck and the back. They were treated at San Francisco General Hospital and released July 7, but tests and treatment are ongoing. Verna said Younga Jun Machorro suffers so much pain she has been unable to return to work as a foreign language instructor for the military. Both the mother and son are still wearing braces and have been traumatized, he said. Machorro and her son had been visiting her family in Seoul, Verna said. One of the goals of the lawsuit, the attorney said, is “to give the family the right to perform an independent investigation” through the court system. A second goal, he said is to challenge alleged “systemic problems in training and inadequacies in communication” among pilots on the part of the airline. Spokesman Ki Won Suh said the airline had no comment on the lawsuit.